Seeking Compensation for Broken Bones? We Can Help. 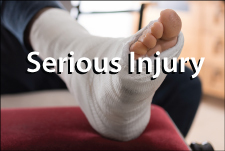 Broken bones, otherwise known as fractures, can be painful and vary in severity. A bone may be completely or partially fractured crosswise, lengthwise or in multiple pieces. Bone fractures can occur for a variety of reasons, including due to trauma from an accident. If that accident occurred because of the negligence of another person, the victim may be able to seek financial compensation through a personal injury claim. If you or a loved one has suffered severe fractures due to an accident, you can seek legal help from the Santa Ana lawyers at Chambers & Noronha. Our law firm represents clients in Orange County and throughout Southern California with a range of injury claims, including those related to severely broken bones. Our attorneys will thoroughly investigate your case to build a strong claim on your behalf, determining exactly how the accident occurred and who is at fault. Our goal is to hold all negligent parties liable for your injuries by obtaining the recovery you deserve to cover medical bills, lost wages and other damages. No matter what the circumstances, we are here to help with all aspects of your legal claim, allowing you to focus on healing and recovery. Contact our firm for a free, no-obligation consultation. Call 714-558-1400 or send a message online using the form on our website.